There is every reason to think that the next 10 years will bring more cures of cerebral palsy by either preventing or by treating the early brain damage that is the root cause. 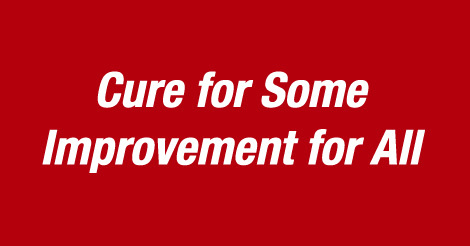 A cure for some and improvement for all is my personal goal and I do not think that this position is a false hope. The results of early cord blood stem cell trials in distressed newborns with HIE are encouraging. The animal studies of endogenous stem cells, given long after the initial brain injury are even more hopeful. And several research groups are starting trials in older children with cerebral palsy. Again, the early results in some cases are amazing. Change is coming and parents now have to stop and think seriously about an important question. Will your child or teenager be able to take part in these new treatments as they become available? Sadly, many will not. These revolutionary new approaches have to go through the clinical trials process before you can access them. And every trial has both inclusion and exclusion criteria. Researchers try to get a representative sample of children with CP, but children with too many of the known later complications of uncontrolled spasticity are unlikely to get into the early trials. The stem cell trials in older children with CP are accepting children from 1 to 10 years of age at this stage. Body alignment issues…contractures and bony distortions will be rare in the youngest children, but the incidence and severity of them will increase with growth. And I am sure that some of them will be excluded from the studies on this basis. So while we push for the ultimate goal of a cure, we should also stop and ask if we are keeping children in the best possible shape? And we should challenge the common practice of discharging teenagers considered good enough. I agree that routine therapy tends to have an age limited benefit, but the reality is that teenagers can still improve their physical and cognitive functions as they grow through puberty and the second peak period of neuroplasticity. Even adults can improve. If you look at an adapted sports program, like www.blazesports.org you will see teens and adults with a wide range of impairments that all perform better in their favorite sport. You will see children and teens with hemiplegia using both their hands to hold a basketball or climb a rock wall and runners with diplegia who have an easy balanced stride. Their brains have improved with maturity and their bodies respond to training and good coaching. Twenty-five to thirty years ago there was a significant philosophical fight in the spinal cord injury world. Some people focused on the search for a cure while others, denying the hope of a cure, tended to focus on accommodations that made life easier for the person with SCI. The battle raged in fundraising with GO FOR A CURE competing with CARE, NOT CURE. Both groups had a valid point of view and eventually the field came together with active research into both the quest for a cure and better treatments to keep patients ready for a cure. Now, some people recover very well from an SCI thanks to early treatment protocols and I am sure stem cells will be part of that focus as well. The techniques and technologies in SCI rehabilitation are equally advanced with new walking assist units rapidly coming online. I think it is time for the cerebral palsy world to come together as a whole and push our doctors, researchers and equipment developers to follow the lead of the SCI and Stroke research and treatment communities to give the children, teens and adults with cerebral palsy a better life as well. I get several emails a week from families who are still only getting the types of interventions that were standard back in the 1980’s. We all know that Medicine is an inherently conservative field, but I believe more public awareness of what is now possible is a first step in the right direction. I am compiling a list of parent led groups that support research, education and help for families for my redesigned blog launching this summer. Please write me with your suggestions for inclusion. As ever, your comments and questions are always welcome. RFTS would like to be included in this blog / discussion! Hi Wendy – RFTS is at the top of the list as one major organization that supports research, education and parent support. It also provides a great source for up to date information on new discoveries and interventions to help children, teens and adults with cerebral palsy. I am not surprised that Reaching for the stars is the first answer my request. Count in Hope for HIE for your resources section! Thanks for all you do! In terms of hope and advancement in the curative sense, as a parent (Laura, PVL resulting in quad CP), I have done many readings in the last few months, including your very useful book. I came across the hyperbaric option and I am quite puzzled by the contradictory positions expressed in the scientific community. Many parents report very beneficial results. Also, I read an editorial from 2014 in Undersea and Hyperbaric Medicine (UHM) as well as the results of an important study in the same edition of UHM. Links just below. But everytime we bring up the subject with medical experts, they quickly discourage us about trying it for Laura. They always refer to a study dating from 2000 that was subsidised by the Quebec government (Collet et al., The Lancet) It seems to me that this study did not meet the highest standards in terms of scientific rigor since it did not include a real control group. How should we understand this controversy? Have you seen young patients trying hyperbaric? Do you think this could be a legitimate treatment? Dear Charles-Antoine, I agree that there is a slowly accumulating group of studies that support the use of HBO, but I remain cautious and advise only using it as part of a reputable facility study. There are practitioners with little or no training in HBO and it is a potentially dangerous procedure.